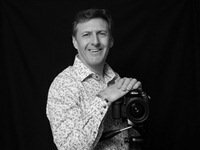 How I got started in photography: Initially I had an interest in portraiture, event and motorsport photography. Once I purchased my first digital SLR I became more interested in portraiture both posed and candid. My photographic skills: It is said that I have the ability to put models at ease due to my casual approach to getting the right pose/shot and I consider this to be one of my key skills. I found inspiration from: Bryan Adams, moody skies. Major events: Birth of son, birth of Grandson, survival of life threatening accident, meeting my future wife. Testimonials: "They're as good as the ones we had taken at Venture and they cost us a fortune!"